This lake-bound geographical marker sits at the point where three European countries intersect. 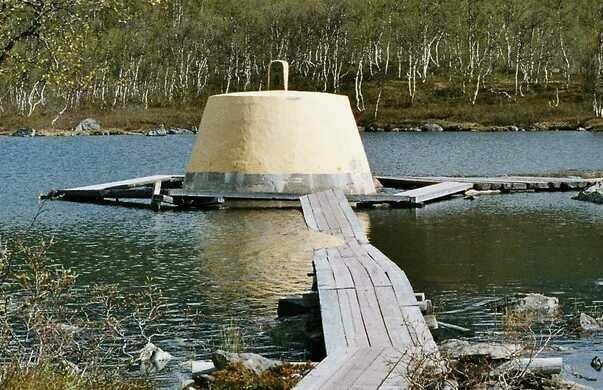 Known alternately as Treriksröset in Swedish, Treriksrøysa in Norwegian, or Kolmen valtakunnan rajapyykki in Finnish, the small plinth that resides at the meeting of these three countries is a strangely epic monument to fastidious cartography as it juts out from the middle of a lake. No matter the language, the name of the monument translates roughly to “Three-Country Cairn,” and was constructed in 1897 to settle a border dispute between the trio. With Russia aiding Finland in the negotiations all three countries finally agreed to their borders and decided that the point where they all meet actually fell in the middle of a lake. Not that that stopped the construction of the stone. The tri-point stone itself, which features carvings from each respective side corresponding to the country it faces, sits atop a bulky yellow foundation of cement which keeps the plinth elevated no matter how high the waves or snow get. During the summer months the cairn can be reached by crossing rickety wooden bridges that often dip into the lake, but in the winter months, it can usually just be approached on foot or sled. No matter the season, visitors are able to travel through three countries just by circling the stone, putting even the most prolific jet-setters to shame. 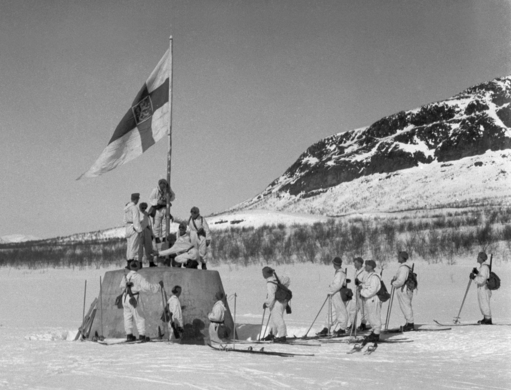 Citizens of Norway want to gift the peak of Mount Halti to Finland for its 100th birthday. The great polar explorer is remembered in this far north Norwegian town, where he embarked on his final expedition. The centuries-old obelisk may have inspired J. R. R. Tolkien.